Adam Perry Smith, beloved son of Joan Smith and the late C. Owen Smith of Camden, Maine, died on the morning of the fall Equinox of injuries sustained in an automobile accident. The previous day, Adam had performed before hundreds of people at the end of a school residency in New Hampshire. A lifelong resident of Camden, Adam was a musician and drummer, playing with many local bands as he grew up. 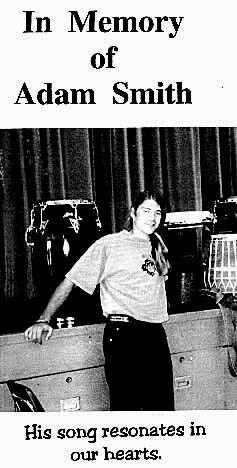 For the last years of his life he was a principal drummer for Arthur Hall, touring the country as an artist in the schools, touching the lives of thousands with African music, dance, and mythology. At the time of his death he was the music director of Ile Ife Films, having successfully completed the series of Ile Ife Philadelphia Maine memorial dance concerts three weeks previously. For the concerts Adam formed the Rhythm of Life Band, which performed at his funeral. Adam had a sparkling personality and a high energy that drew many dancers beyond themselves in classes, workshops, rehearsals, and performances. 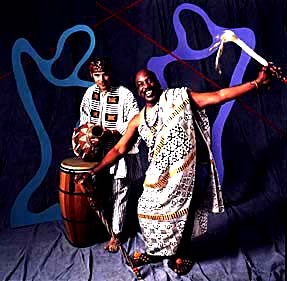 His drums continue to reverberate through many films of the Arthur Hall Collection, and through the Obatala Ashe concert in his honor at the University of New Hampshire and the Rhythm of Life Concert in Camden at the end of 1995. Adam's spirit is one of the major inspirations for Arthur Hall's current production of Requiem, which had its premiere in the Rhythm of Life as "Requiem for Adam." In addition to his mother, Adam is survived by four brothers, Nick, Sam, Peter, and Ben Smith, a sister, Susan Smith, three sisters-in-law, a brother in law, three nephews, three nieces, an adoptive sister and her husband, his dear friend Cynthea "Bo" Lea, and many loving friends and colleagues.